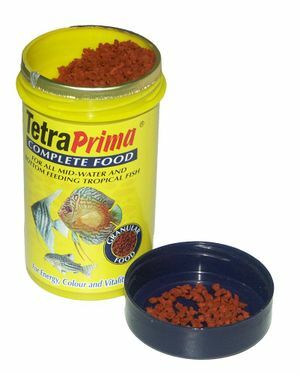 TetraPrima is a commerical food by Tetra for mid-water and bottom feeding tropical fish and aquatic frogs such as Dwarf African Frogs. It comes in a variety of plastic tubs with a foil seal. 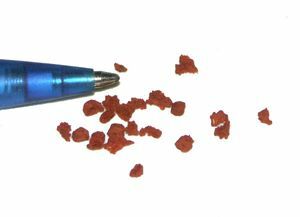 This food is a small (1-3mm), granular type red coloured food which quickly sinks and is taken by most bottom feeders. The food is taken by mollies, bottom feeders like corys, aquatic dwarf frogs, small loaches and even small tetras like Glowlights will take to it. It stays together on the substrate and does not fall apart for a long time. All proper, high quality food should come in a sealed container of some kind as exposure to the air starts the decay process of any vitamins and protein. Never buy any that has the seal broken as they could be infected with bacteria. A typical commerical product will list all its ingredients, the order these are shown indicate the largest amount of that food. Vegetable protein - Adds extra protein. Cereals - Often used to bulk out the food and to hold it together. This page was last edited on 22 June 2011, at 19:13.